Atomic physics is the field of physics that studies atoms as an isolated system of electrons and an atomic nucleus. It is primarily concerned with the arrangement of electrons around the nucleus and the processes by which these arrangements change. This comprises ions, neutral atoms and, unless otherwise stated, it can be assumed that the term atom includes ions. The term atomic physics can be associated with nuclear power and nuclear weapons, due to the synonymous use of atomic and nuclear in standard English. Physicists distinguish between atomic physics — which deals with the atom as a system consisting of a nucleus and electrons — and nuclear physics, which considers atomic nuclei alone. As with many scientific fields, strict delineation can be highly contrived and atomic physics is often considered in the wider context of atomic, molecular, and optical physics. Physics research groups are usually so classified. Atomic physics primarily considers atoms in isolation. Atomic models will consist of a single nucleus that may be surrounded by one or more bound electrons. It is not concerned with the formation of molecules (although much of the physics is identical), nor does it examine atoms in a solid state as condensed matter. It is concerned with processes such as ionization and excitation by photons or collisions with atomic particles. While modelling atoms in isolation may not seem realistic, if one considers atoms in a gas or plasma then the time-scales for atom-atom interactions are huge in comparison to the atomic processes that are generally considered. This means that the individual atoms can be treated as if each were in isolation, as the vast majority of the time they are. By this consideration atomic physics provides the underlying theory in plasma physics and atmospheric physics, even though both deal with very large numbers of atoms. Electrons form notional shells around the nucleus. These are normally in a ground state but can be excited by the absorption of energy from light (photons), magnetic fields, or interaction with a colliding particle (typically ions or other electrons). Electrons that populate a shell are said to be in a bound state. The energy necessary to remove an electron from its shell (taking it to infinity) is called the binding energy. Any quantity of energy absorbed by the electron in excess of this amount is converted to kinetic energy according to the conservation of energy. The atom is said to have undergone the process of ionization. If the electron absorbs a quantity of energy less than the binding energy, it will be transferred to an excited state. After a certain time, the electron in an excited state will "jump" (undergo a transition) to a lower state. In a neutral atom, the system will emit a photon of the difference in energy, since energy is conserved. If an inner electron has absorbed more than the binding energy (so that the atom ionizes), then a more outer electron may undergo a transition to fill the inner orbital. In this case, a visible photon or a characteristic x-ray is emitted, or a phenomenon known as the Auger effect may take place, where the released energy is transferred to another bound electron, causing it to go into the continuum. The Auger effect allows one to multiply ionize an atom with a single photon. There are rather strict selection rules as to the electronic configurations that can be reached by excitation by light — however there are no such rules for excitation by collision processes. The majority of fields in physics can be divided between theoretical work and experimental work, and atomic physics is no exception. It is usually the case, but not always, that progress goes in alternate cycles from an experimental observation, through to a theoretical explanation followed by some predictions that may or may not be confirmed by experiment, and so on. Of course, the current state of technology at any given time can put limitations on what can be achieved experimentally and theoretically so it may take considerable time for theory to be refined. One of the earliest steps towards atomic physics was the recognition that matter was composed of atoms. It forms a part of the texts written in 6th century BC to 2nd century BC such as those of Democritus or Vaisheshika Sutra written by Kanad. This theory was later developed in the modern sense of the basic unit of a chemical element by the British chemist and physicist John Dalton in the 18th century. At this stage, it wasn't clear what atoms were although they could be described and classified by their properties (in bulk). The invention of the periodic system of elements by Mendeleev was another great step forward. The true beginning of atomic physics is marked by the discovery of spectral lines and attempts to describe the phenomenon, most notably by Joseph von Fraunhofer. The study of these lines led to the Bohr atom model and to the birth of quantum mechanics. In seeking to explain atomic spectra an entirely new mathematical model of matter was revealed. As far as atoms and their electron shells were concerned, not only did this yield a better overall description, i.e. 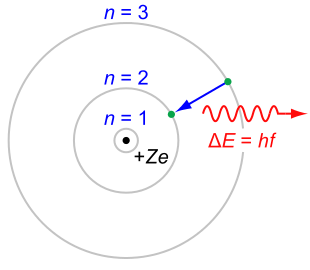 the atomic orbital model, but it also provided a new theoretical basis for chemistry (quantum chemistry) and spectroscopy. Since the Second World War, both theoretical and experimental fields have advanced at a rapid pace. This can be attributed to progress in computing technology, which has allowed larger and more sophisticated models of atomic structure and associated collision processes. Similar technological advances in accelerators, detectors, magnetic field generation and lasers have greatly assisted experimental work. Bransden, BH; Joachain, CJ (2002). Physics of Atoms and Molecules (2nd ed.). Prentice Hall. ISBN 0-582-35692-X. Condon, E.U. & Shortley, G.H. (1935). The Theory of Atomic Spectra. Cambridge University Press. ISBN 0-521-09209-4. Lindgren, I. & Morrison, J. (1986). Atomic Many-Body Theory (Second ed.). Springer-Verlag. ISBN 0-387-16649-1. Wikimedia Commons has media related to Atomic physics.